RBTH presents a selection of views from leading Russian media, featuring analysis of the peace talks in Donetsk, the proposed EU police mission to Ukraine, and realities on the ground in Lugansk. The key result of the meeting was the agreement that the breakaway republics will adhere to the ceasefire announced on Monday by Ukrainian President Petro Poroshenko. Kommersant reported that this outcome was expected as soon as it the chairman of the organization Ukrainian Choice, Viktor Medvedchuk, confirmed his participation in the talks. Many in Kiev consider Medvedchuk to be close to Moscow. According to the paper, the Donetsk meeting was Russia’s response to calls from the United States and the EU to participate more actively in settling the Ukraine conflict. As long as the ceasefire lasts, there is less justification for intensifying sanctions against Russia. However, the consensus of experts who spoke to Kommersant is that the ceasefire with be short lived, and either hostilities will resume or eastern Ukraine will become a frozen conflict zone similar to Transnitria in Moldova. The newspaper Vzglyad published an article reporting that a European Union police mission similar to that operating in Kosovo will soon be launched in Ukraine. The UK, Sweden, and Poland – the EU countries that have most sharply criticized Russia for the situation in Ukraine according to the paper – have initiated this mission. The purpose of the mission will be to reorganize Ukraine’s law enforcement system according to European standards, and retrain judges, police officers and general prosecutors. The newspaper noted that, as in Kosovo, the EU police mission to Ukraine will be responsible not only for retraining personnel, but also for directly ensuring regional security. In Kosovo, the EU mission replaced the UN mission and took on full responsibility for enforcing the rule of law. At this point, the mission’s role in resolving the situation in the Donetsk and Lugansk regions is unclear. So far, all statements from Ukraine and Russia regarding police missions have emphasized not the EU mission, but the OSCE mission, since Ukrainian President Petro Poroshenko suggested that Russia send observers to eastern Ukraine as part of an OSCE mission. Reporting about the situation in Lugansk, the website Gazeta.ru wrote that life goes on in the city, despite a curfew that begins every evening at 11:00 pm. 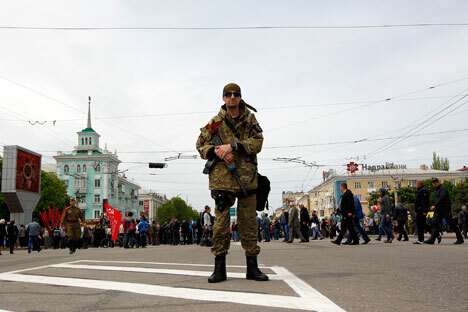 “Looking at a regular street – with stores, billboards, lively street trading, and the occasional tram – it is hard to believe that the People’s Republic is practically under siege,” Gazeta.ru reported. According to the website, prices are slightly lower than those in Russia, and have hardly changed since the proclamation of the Lugansk People’s Republic. The website also reported that members of the local militia, which counts Russians and immigrants from Crimea among its ranks, have been complaining of a lack of weapons and ammunition. There is also a steady stream of people leaving the city, mostly in the direction of the Russian border. However, there is also a significant number of people entering the city with the intention of joining the militia. “There are enough people, and those of the male population who are not yet in the militia will take up arms if things get really hot,” Gazeta.ru quoted Lugansk residents as saying.